An international team of researchers has proposed a new method to investigate the inner workings of supernovae explosions. This new method uses meteorites and is unique in that it can determine the contribution from electron anti-neutrinos, enigmatic particles which can't be tracked through other means. Supernovae are important events in the evolution of stars and galaxies, but the details of how the explosions occur are still unknown. This research, led by Takehito Hayakawa, a visiting professor at the National Astronomical Observatory of Japan, found a method to investigate the role of electron anti-neutrinos in supernovae. By measuring the amount of 98Ru (an isotope of Ruthenium) in meteorites, it should be possible to estimate how much of its progenitor 98Tc (a short-lived isotope of Technetium) was present in the material from which the Solar System formed. The amount of 98Tc in turn is sensitive to the characteristics, such as temperature, of electron anti-neutrinos in the supernova process; as well as to how much time passed between the supernova and the formation of the Solar System. The expected traces of 98Tc are only a little below the smallest currently detectable levels, raising hopes that they will be measured in the near future. Hayakawa explains, "There are six neutrino species. Previous studies have shown that neutrino-isotopes are predominantly produced by the five neutrino species other than the electron anti-neutrino. 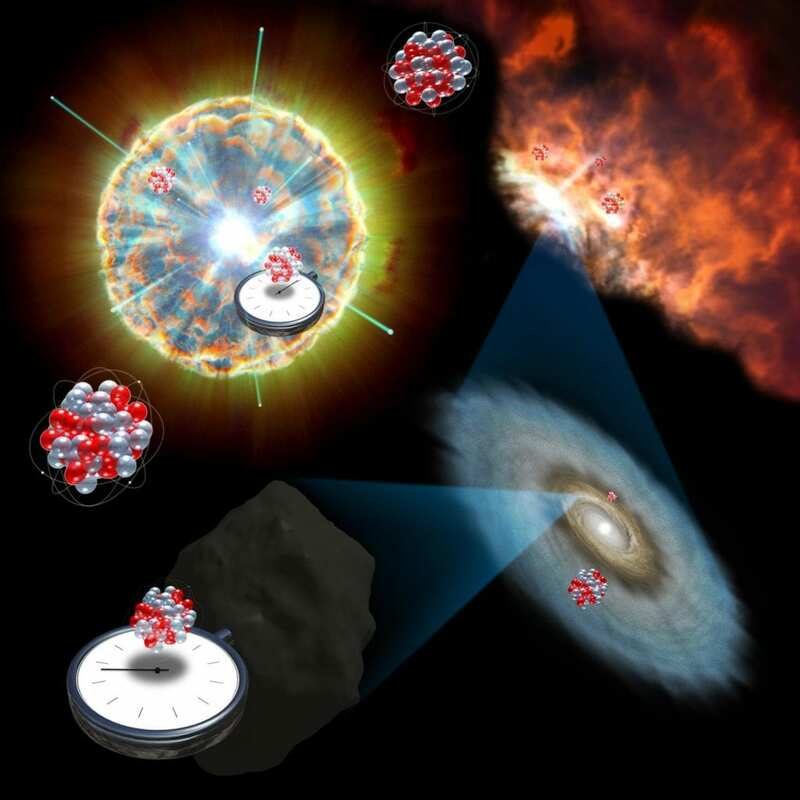 By finding a neutrino-isotope synthesized predominantly by the electron anti-neutrino, we can estimate the temperatures of all six neutrino species, which are important for understanding the supernova explosion mechanism." At the end of its life, a massive star dies in a fiery explosion known as a supernova. This explosion blasts most of the mass in the star out into outer space. That mass is then recycled into new stars and planets, leaving distinct chemical signatures which tell scientists about the supernova. Meteorites, sometimes called falling stars, formed from material left over from the birth of the Solar System, thus preserving the original chemical signatures. This work appeared in Physical Review Letters on Sept. 4, 2018.